The LEED AP Operations + Maintenance (O+M) specialty credential proves to the industry and your clients that you can implement the sustainable operations and maintenance of existing buildings. This 1-day class focuses on sustainable practices and reducing the environmental impact of a building throughout its functional life cycle. LEED for Existing Buildings (EB: O+M) addresses whole-building cleaning and maintenance, recycling programs, water efficiency, Energy Star benchmarking (and efficiency), alternative transportation, systems upgrades, and more. In order to earn your LEED AP O+M credential, you should already have passed (or be in process to pass) the LEED Green Associate exam or already be a LEED AP or LEED AP+. 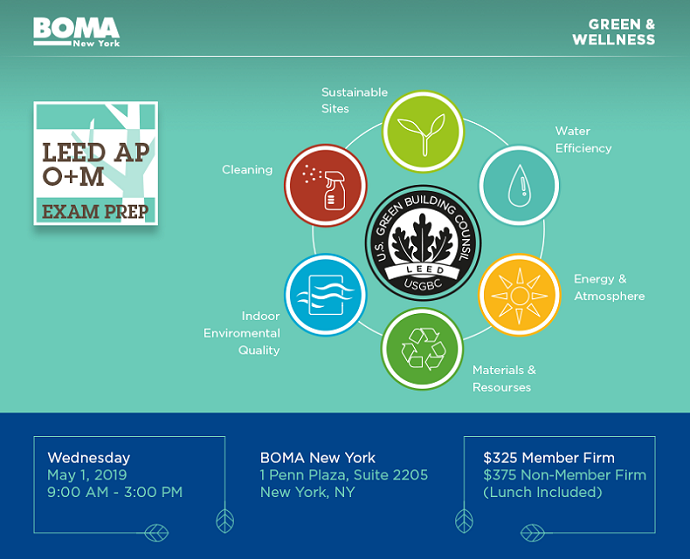 The class includes: handouts of class slides, access to an online exam simulator with 400 realistic practice test questions (unlimited use for 120 days), O+M Study Sheets, and access to our LEED experts for follow-up questions.